New Haven's Artspace Underground hosts round one of the Tweefort and Seditionary Kitten Records team-up, featuring the solo debut of Steven Deal. Opening will be New Haven's Swarm The Moon. 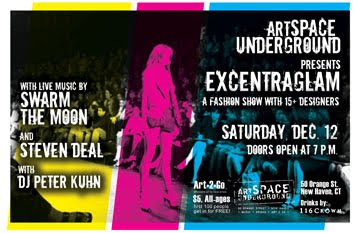 ArtSpace New Haven will also present a fashion show with 15+ designers and a DJ set by Peter Kuhn. Steven Deal has been playing since he was 13 years old. Deal first had to sneak into clubs, but at age 18 he got a notarized note from his parents to play when his band, Bleached Black, got its first record deal with Relativity/Sony. Deal toured the USA and Canada several times as a support act for groups such as Dinosaur Jr., Das Damen, The Screaming Trees and The Neighborhoods, to name a few. Deal has worked with producers Lou Giordano (Husker Du, Volcano Suns, GooGoo Dolls, etc.) and Peter Katis (Interpol, Philistines, Jr., Babyheads, Zambonis, etc.) among many others. Deal has also played in bands such as Chopper, The Absolute Zeros and The Naomi Star and appeared in the New Haven punk/new wave documentary "It Happened But Nobody Noticed." Read John's take on Deal's latest release Radio Twelve here: CLICK. New Haven's Swarm the Moon was formed in the summer of 2009 by Anthony Acock (drums,) Thom Smith (guitar), Tim Leonard (vocals/guitar) and Matty Mauro (bass). The band is a blend of equal parts noise, pop and rock. They have already drawn comparisons ranging from early Promise Ring to Sonic Youth.